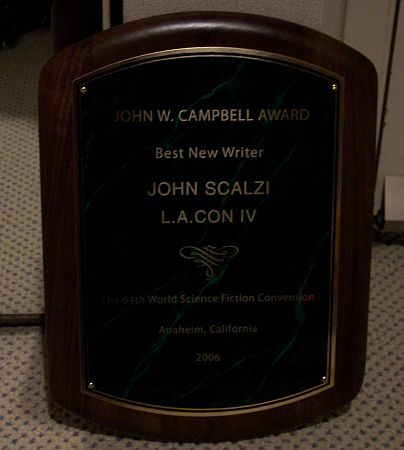 Hi, I'm John Scalzi, and I'm the winner of the John W. Campbell Award for Best New Writer. Exciting night. Now it's late and I'm very tired, and I'm going to sleep. But I thought you'd all like to know. I recently found a copy of "Old Man's War" at a local B&N. I haven't had a chance to read it, yet, but it's definitely moving higher up on my priority list! Woo-hoo-hoo!!! That's wonderful news. Now I have yet another reason to buy you a drink. Yeah, thats all and good, but Pluto is still not a planet, what about that? Congrats, John. You would have been my vote for the award, hands down. Of course, it helps not having read any of the other authors who were nominated. My hearty congratulations to you. And how cool was it to have Krissy (and Athena?) along to witness this triumph, eh? That's pretty impressive, no doubt about it. Thirty years from now, I'll be able to look back in the archives (from the mind over matter interface installed just before they put me into cryo-stasis) and remember this night. Hey--HUGE congrats!! You deserved it!!! And it couldn't happen to a nicer guy, either. Awwww! As soon as you got back to your hotel room, you propped it up near the door and took its picture. Gratz, John! Now you have something tangible to point to if a certain pirate of our acquaintance ever again asks "So dude-- like how many people signed aboard yer literary revolution today?" Congratulations! Glad to hear that you've finally gotten the book writing thing down well enough to get a new writer award, after what, your fifth book? I'm sure it's the first of many! In honor of you winning, and because I work there, I'm crediting your eMusic account for 65 downloads. You missed downloading over a few months, and the tracks don't accumulate. We're allowed to credit a month's missed downloads for customers on a one time basis, and I figured hey, why not. Wonderful. Well-deserved. Now, when do we get The Last Colony? I am eagerly awaiting its appearance. Congratulations, John. I've thoroughly enjoyed your books and your blog. Congrats. Very happy to see a worthy writer get recognized! Congratulations! I eagerly await more sweet, sweet, award-winning crack. Outstanding! May this award be the first of many!! Awesome! I loved that book. Excellent. Glad you won that award. I voted for you for the Campbell *and* the Hugo. Wish you'd won both! Congratulations! Always nice to see somebody get some well-deserved recognition. wow, scalzi, that is sooo cool! congrats! Back in the early days of the Campbell, George RR Martin edited a series of anthologies with stories by the other nominees. I think since in some ways your fiction is a tribute to classic SF, you're pretty much obligated to restart this particular tradition and all the voices in my head agree. Are you a big enough nerd for me to say "w00t!"? Ahh, who cares. w00t! w00000t!! John -- congratulations. So very glad to hear. Everyone else: If you're interested, full results are here, and I found a flicker set you might enjoy here. John, that is some crown. Again, congrats to the John W. Campbell award-winning, Hugo-nominated John Scalzi. ever attempted to lend the consoling voice of Truth too in this world made dim by the money-hungry morally-indifferent corporate liberals?" Avast! Fantastic John. I am sure this is the first of many awards. Congratulations! And it was great to get to meet you and your family this weekend. Well deserved - karma at work. I saw your name on the list this morning and thought, hey, I sorta kinda know that guy, I remember when he was just starting the book! Big congrats from a long ago sometime correspondent! Congratulations John, we never had any doubt!! It would seem that now people will want to touch me for the famous people I know. Every now and then, the right person gets an award! Congratulations! And you still have that new writer smell to boot. Congrats, John. Woohoo! I was hoping you would get it. I think it was well deserved too. Part of me now wants to go na-na-boo-boo to all those that wrote reviews about you only writing knock-offs. 2006, not "Snakes on a Year" at all, but "Year of the Scalzanator". It might not be the most original comment but here it is anyway: Congratulation! I just know you are having a giggly geekasm right now if the smiles form the photos are any indicator. Great news! But what the hell was that on your head in the pic at Kathryn Cramer's blog? Something your lovely daughter made for you, I assume? Nifty. Congratulations! It's nice when it goes to someone I actually know. Maybe they'll name a dwarf planet after you? Congratulations! Your speech, in which you urged the Hugo audience to go buy all the other nominees' books, was very classy. You win a prestigious award just a few days after Pluto is demoted from planethood? I smell quid pro quo here. Congrats! Was hoping to see you get the Hugo, too, but I'm glad to see you got some recognition for your work. Keep up the good work! Yay, you! Now you can start working on bagging the other Hugo awards, category by category. Congrats! Say, though, wasn't there a chapter you were supposed to finish? though I always thought that sci fi awards should have like hologram projections, or laser light robots attached to them. mahogany and ivory is so non-sci-fi. I think we need a field of research that will allow sci-fi awards to be made of some rare metal that is only used for scientific purposes, and can destroy large urban area's. That would be an award fitting for Sci-fi. Although, truthers be told, I would kill for the priveledge of an award that is only awarded once a year. It could be made of pig intestines, and embossed with dog poo, and it's still a beautiful beautiful thing to own, to hold, and especialy, to have earned. I don't doubt that you earned it, loved OMW, and haven't gotten around to "Ghost Brigades" yet, only cuz I wanna dedicate much of a day to reading it in whole. Good for you hoss, and once again, Whee Yay Whee. what the hell was that on your head in the pic at Kathryn Cramer's blog? Isn't that the special mating headdress worn by Lieutenant Ilia in Star Trek: The Motion Picture? Congratulations Mr. Scalzi. I have recently read OMW and thoroughly enjoyed it. So much so that I paid my wife $20 to read it (she's not the SF type). In retrospect, she read the book so fast and enjoyed it so much I could have saved the $$. So here's to your successful career with, hopefully, many more books to come for us to enjoy. And here's to me saving some money! A toast to Mr. Scalzi, all of the other winners, and all of the nominees! Dude, that's AWESOME! YOU ROCK!!! That's just Scalztacular! Well done and well deserved! Congratulations. And despite some rain, there was a picture-perfect sunset over southwestern Ohio last night! Wow, that is really something. Congratulations! Congratulations John! And to think they called us generation X. Looking forward to reading The Last Colony and The Android's Dream. John, I finally got around to visiting your site after reading OMW and TGB. Serious congrats on the award, amigo! The words "well deserved" seems horribly inadequate. I think I read something about a final book for the OMW series here. All I can say is that Ray Feist had a great run with Midkemia and his Rift War series across a generational story line. If you choose not to venture there again, I hope you'll let other writers visit the OMW universe akin to the Man-Kzin Wars. Ooh, so shiny and pretty! Congrats, John! An award well deserved! Late to the party, but let me add a "w00T!!!!!1!" and big honkin' congrats! Congrats, dude. You deserve it. You are my idol Mr. Scalzi! I enjoy your imagination, writings and blog. One more set of congratulations from this corner. A well deserved award, and the classiest acceptance speech of the evening. Congratulations! This is so cool! And well-deserved! The only Hugo that made me smile more was David Hartwell's! And I love the tiara; what a GREAT idea! I would like to be the 324th to offer you my heartiest congratulations. You rock, John Scalzi! That thing on his head was the brand-new Campbell Award tiara, and while I haven't seen the picture, it looked damn good on him in person. A very very tardy Congratulations! This rocks! You're in very good company over the last couple of uears! Sorry that was kind of late. No worries. I still thank you. Amazing and gratifying to see you get the success you deserve. Congratulations from another fan.